As many of you know, Peter is a successful screenwriter and this CRUSADE story is a quirky adventure so good that JMS slated it for the second season. Find out if “that day on Mars with Louise meant anything to Brad” …and, more importantly, who the heck ARE Louise and Brad? The dramatic way Galen gets the attention of the EXCALIBUR crew, causing a panic in the process. The introduction of a new planet whose surface makes a disconcerting crunching sound when walked on; you’ll cringe when you find out why. What Dureena, and other natives of Zander Prime, have twice the normal number of. Why Galen was willing to swallow a large, living bug. Why Peter was compelled to write an episode of CRUSADE and what he thought about seeing it again 12 years later. The reason he chose to feature bugs so prominently in the story. Why JMS failed to comment on the script when it was originally submitted and how Peter interpreted the lack of response. The obsession Captain Gideon indulged in the privacy of his quarters. Find out what Dureena did with the Old One after he died. What “natural substances” were prized by Dureena’s people. What the Prozeta Corporation was originally named. Which BABYLON 5 character Captain Gideon thought was behind the EXCALIBUR’s diversion to Theta 49. Theta 49, and how they reacted. they wanted to inhabit it. Ultimate trivia: the creepy diet of the Morcetti. Trimmed for time: Galen’s explanation of how the rock indicated the location of the Well of Forever. The book Dureena was reading prior to the search for the Well… and what wisdom she took from it. What happens immediately after you escape an amorous alien jellyfish (a moment not included in the episode). Lost in revision: the action Max Eilerson took after the Excalibur was molested by the Fen. Dureena’sphilosophy on the aspect of our own deaths we CAN control. Detailed close-ups of Galen’s flyer. Learn more about the nuances of the ship. Concept designs for the over-sexed inhabitants of hyperspace. See them in their totality! Annotated designs for the Well of Forever that highlight aspects of it that could not be appreciated when seen in the episode. Read both this and What the Hell happened over the weekend. I thought this was the stronger of the two books since I got what I was promised in this book. Peter is a great writer and he really nails the characters as well as life a crew at sea for too long. Since I haven’t seen Crusade in a very long time, it was nice to go back and read the stories. I actually like adding the Mr. Jones subplot since it shed some light on the fate of PSI Corp as well as what the government was doing in their absence. I highly recommend this book and look forward to part 2. 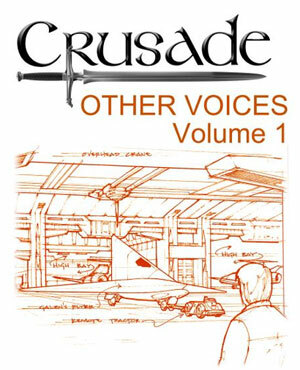 Less than a week until CRUSADE: OTHER VOICES Volume 2 is available for order.